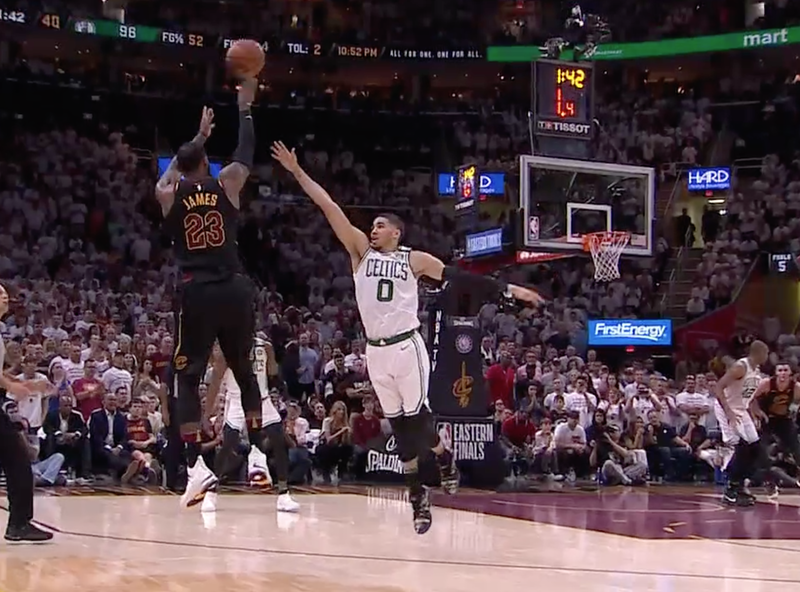 The image above shows LeBron James just after he drained a three-pointer over Jayson Tatum last night in game six of the 2018 NBA's Eastern Conference Finals. 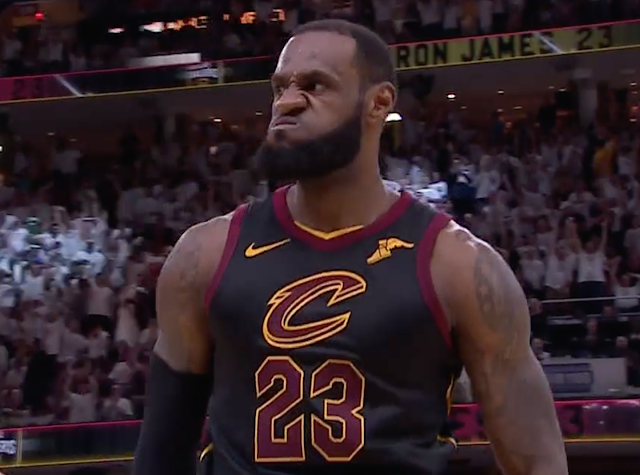 Notice LeBron's jaw - and the degree to which it's jutting forward. This is known as a Jaw Jut - and it's highly indicative of an adrenaline surge. His eyebrows are also drawn together and vectored downward - yet his eyelids are open wide and tight. His nostrils are also flared. James' face - identical to that of rage is further evidence of his extreme adrenaline surge in this moment. A few seconds earlier we see King James in action. This would be LeBron's 44th, 45th, and 46th points - in a game where he would score 48 points in 48 minutes. After making the shot, he bumped Jayson Tatum in another display of dominance. 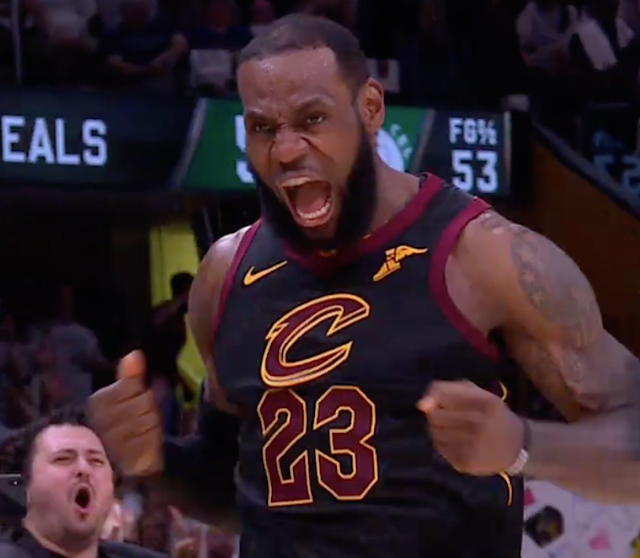 Other hyper-alpha behaviors displayed by the Cleveland Cavalier forward included screaming and the near-beating of his chest with closed fists. SUMMARY: Every experienced athlete knows, that at certain times, such dominance displays not only serve to psych oneself up - but also psyche-out their opponents. Simultaneously, these phenomena are, of course, also celebratory. 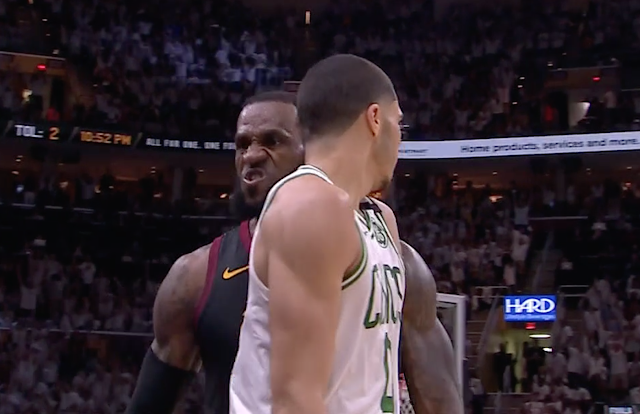 Along with LeBron, some athletes are much more skilled at channeling their adrenaline surges' than others. This ability allows them to not only perform superiorly on the court, field, pitch, or rink - but more importantly, it's a life skill which helps hone their impulse control - minimizing anger crescendos and (hopefully) preventing violence. This is not only a reason to take up sports - but should be sought and remain a continuing focus of development, particularly with younger athletes. Body Language Analysis No. 4293: Why is Harvey Weinstein Smiling? Body Language Analysis No. 4291: Donald Trump and Disguising Disgust - "I don't know who the hell wrote that line"
Body Language and Medical Analysis No. 4221: Why are Donald Trump's Pupils So Large?